Usually by the time a movie has reached its fourth installment, the proceedings have become tedious. All reports were that the fourth MISSION: IMPOSSIBLE film had avoided this trap, with more than a few critics landing it a spot on their best of 2011 list. Liz and I finally found a night out, hit up the movies, and decided to see what many people were calling an intense blockbuster experience. 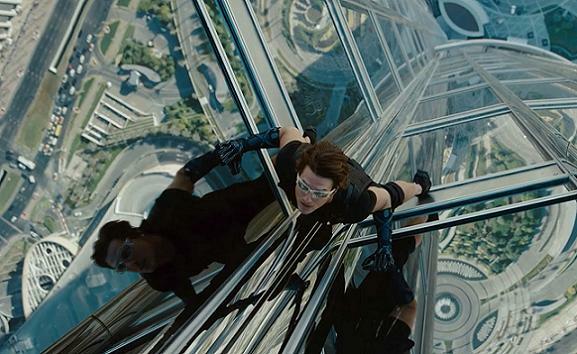 I watched MISSION: IMPOSSIBLE – GHOST PROTOCOL in theaters on 1.3.12. It was my first viewing of the film. The series started with director Brian DePalma, moved to John Woo, JJ Abrams, and (for this fourth part) Brad Bird. Each director brings his own take. DePalma has his paranoia, Woo his white birds (and I suppose, his action style), Abrams brings a large scope. For Brad Bird, he comes to M:I with out ever having directed a live action feature. His previous directorial efforts were the animated films THE IRON GIANT and Pixar’s THE INCREDIBLES and RATATOUILLE. He has been a member of Pixar’s creative team for years, and so brings his a unique cache to GHOST PROTOCAL. The look here is grand in both cinematography and color. Bird goes for the big action sequences as if he were filming an animated film with no boundaries. In fact, his climactic scene in a parking garage resembles, somewhat, the jumping door sequence of MONSTERS INC.
My feelings on Tom Cruise are well documented within these pages. Is he a nutjob? Probably. Did he ruin my adolescence by marrying Katie Holmes, shattering her innocence, and thrusting me into adulthood. Yep. But he still regularly makes entertaining movies, and sometimes is even involved in great films. Though GHOST PROTOCOL is certainly more the former than the latter, it still manages to be about as taught and well-executed as an action movie can be. Intensity is the word of the day here, and it isn’t always hero vs. villain. In fact, the most enthralling sequence occurs when Tom Cruise tries to scale the world’s tallest building with failing technology. This film probably has the weakest villain of the M:I series, but since the film focuses so much on the team aspect of the missions, the lack of a Philip Seymour Hoffman type villain doesn’t hinder this flick. Failing technology is one of the driving themes of this movie. While the team always seems to have every piece of equipment they need despite not being helped by the government any longer, they can never fully rely on what they use. This doesn’t occur because they are disavowed as an organization, but rather because the creative team behind this movie decided that they wanted to make Ethan Hunt and company do it a little more on their own. While not calling this M:I 4, this is certainly a continuation of the series. Ethan Hunt’s marriage is a central part of the story. A cameo from a former friend in the final scene is also a nod to the continuing story. I like that. It gives more depth to the characters. Brad Bird does an excellent job letting them breath. There is a scene early on between Cruise and Jeremy Renner: a discussion on why Cruise uses a flare to distract his enemies, and how it works. It is the sort of scene which often ends up in the deleted scenes of the Blu Ray release because it does not directly effect the action. However, it exposes some of the differences between the two characters, and (especially as more of the story develops) highlights what separates them. There is certainly a level of disbelief here. They seem to get a lot of information about targets despite being cut off from home. They seem to always have what they need, even in very short notice (how did they plan, get the materials for, and execute the Kremlin job in four hours, for example). Yet the script is still well above average. It doesn’t wait for you to catch up and is successful in much the way the first M:I film was for the same reasons. Also, it gives Simon Pegg some great comic relief bits which lighten the proceedings just the right amount. The end absolutely leaves open the door for more future, films. And well it should. This is probably the most unique series out there. As long as they give time between each film, keep hiring new unique directors (even if John Woo’s entry was off-base) and stay away from too many masks, this is a series which I will always be lining up for. ~ by johnlink00 on January 4, 2012.